Everyone wants to have a bright, white and beautiful smile, and when people feel good about their smile, it can boost self-esteem. However, many things can cause teeth to become discolored or stained, including tobacco use, regular consumption of coffee, tea or soda, and even certain medications. Also, some discoloration occurs as a natural result of aging. The easiest solution for our Fort Wayne patients is teeth whitening, a process that uses hydrogen peroxide to penetrate deep into the teeth to bleach stains. Although there are countless over-the-counter products that claim to whiten teeth, nothing is quite as effective as a professional in-office treatment. Dr. Berger and Dr. Robison in Fort Wayne can get teeth noticeably whiter in just a single visit. If you are looking for immediate results, an in-office teeth whitening treatment is the way to go. The whitening gel that is used by a professional is stronger than products available off the shelf, and a special light is used to activate the bleaching agent. This speeds up the process, so that patients will notice a change right away. When an in-office whitening treatment is combined with an at-home touch up kit, it becomes possible for patients to not only achieve whiter teeth, but to maintain them. This is the most effective treatment for discoloration short of replacing or covering the natural teeth. Of course, stains and discoloration are often the result of diet, so people who use any form of tobacco or who consume a lot of dark beverages, such as coffee, tea and soda, are more likely to have problems. Sometimes teeth are stained during childhood development. For example, exposure to tetracycline or high levels of fluoride in children has been known to cause stains. Some discoloration is a normal part of getting older, as tooth enamel gets thinner and more translucent. 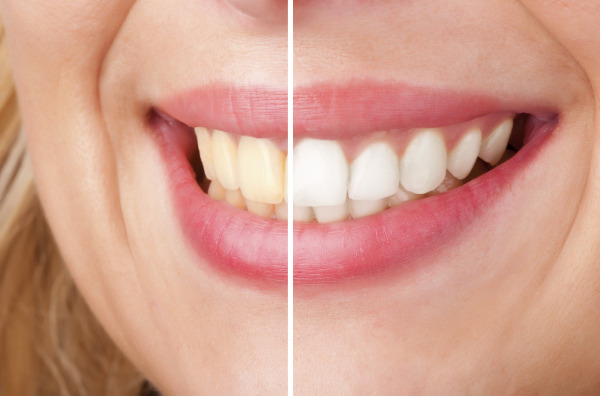 In some cases, teeth might be so severely discolored that tooth whitening gel just doesn't do the job. In those instances, we can recommend other treatments, such as dental veneers. The good news is that no matter how severely stained or discolored your teeth are, there is always going to be a way to give you a bright, white smile. Modern dentistry has brought about a revolution in cosmetic treatment.